A vibrant, cosmopolitan culture anchored in Midwestern hospitality. 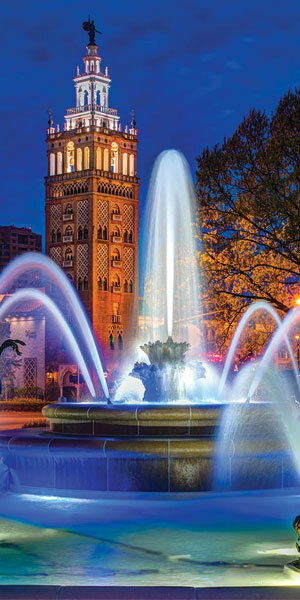 An energetic city forged by a rich history, Kansas City is brimming with activities to keep you entertained—eclectic cuisine, swinging jazz, one-of-a-kind museums, a thriving arts scene and fantastic shopping. Part of the city’s charm lies in its impressive network of parks and boulevards and of course, exquisite fountains. The world-renowned jazz legacy continues today in clubs throughout the city. For barbecue lovers, the city’s signature food can be found at nearly 100 barbecue establishments, but visitors also delight in restaurants of every ethnic origin. Pack your bags and discover something unique and unexpected in Kansas City. Why wait? Get started and book your flight and hotel room all through VisitKC.com. In the center of it all describes so much more than Kansas City’s geography. A convenient location for domestic and international travelers alike. Kansas City’s passion for sports will leave you cheering. Tailgating at Arrowhead is a sports bucket list item analogous to the experience of seeing the Cubs play at Wrigley. It’s not about sports; it’s about a cultural experience. Kansas City’s cool, cultural vibe is all around. No wonder Hallmark and Walt Disney both got their starts here. Tap into your artistic side with the acclaimed Nelson-Atkins Museum of Art, 65 performing arts groups, the Crossroads Arts District and the world-class Kauffman Center for the Performing Arts. “Kansas City” and “barbecue” have been synonymous for over 100 years. Today, barbecue still stands as the city’s signature cuisine. So much so, that it attracts people from all over the world who just have to see and taste it for themselves. Barbecue is just the beginning. A culinary crossroads, Kansas City is cooking with all kinds of flavors. Whether you rub elbows with award-winning chefs or dig into farm-to-table favorites, you won’t go home hungry. Since the early 1900s, Kansas City has been synonymous with jazz. Today, those jazz roots still run deep and the genre is as vibrant here as ever, fueling more than 40 jazz venues on a regular basis.